Join The Student Blogging Challenge Now – Starts Mid September! It is now time to join in on the bi-annual student blogging challenge! This challenge is all about having fun, improving blogging and reflective writing skills, and building readership and connections with a global audience. Last year, the two challenges included thousands of students from over 15 countries around the world! What is the Student Blogging Challenge? The Student Blogging Challenge runs twice yearly. A new Challenge starts March and September, each year. It is made up of a series of 10 weekly tasks all designed to improve blogging and commenting skills while connecting students with a global audience. The Challenge is open to both class blogs and to individual student bloggers from all over the world and of all ages – blogs doesn’t need to be hosted by Edublogs to participate! 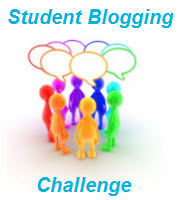 The Student Blogging Challenge is coordinated by Sue Wyatt, Sue Waters and Ronnie Burt. Past challenges have included adding comics and widgets, writing creative posts, discussing travelling, comment etiquette, and more. We’ve now opened registration for students and teachers who would like to participate in the challenge which starts in mid September. How do I get the latest news from the Student Blogging Challenge? 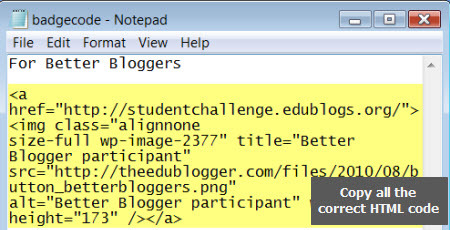 All weekly tasks and upcoming events will be published on Challenge Yourself to Blog (the Student Blogging Challenge blog). Do you have any ideas for challenge tasks? This is the fifth challenge Sue Wyatt have organized. She would love ideas for cool challenge activities. Please help with ideas for challenge activities by sharing your ideas here! And for extra incentive to share your ideas — we’ve decided to give away ten Edublogs Pro 12 month subscriptions (formerly known as Edublogs Supporters) to the 10 best challenge ideas! Every challenge, Sue Wyatt tries to visit each individual student blog at least 3 times over the period of the challenge. This is becoming harder to visit all the student blogs — due to the numbers of students participating! A few clues about how to set up their blogs would be great for the newer students who have only had their blogs less than a week or so . Alternatively choose a post they have written or look at their about page to leave a comment for them. We would like to do is allocate about 20-30 student blogs to each volunteer. Wanting to increase their understanding of how blogs can be used with students. Unable to participate with their students in our current Challenge but who want to learn more about the Student Blogging Challenge. Also excellent for students who have participated in previous Student Blogging Challenges and who would love to support other student bloggers! And off course, we appreciate how busy everyone is so we’ve decided to give away twenty free Edublogs Pro 12 month subscriptions (formerly known as Edublogs Supporters) to our twenty best helpers! Please leave a comment on this post if you would like to become a Student Blogging Helper! Can you also tell which age group of students you would like to work with! We thought some of you might like to add badges to your blogs to let your readers know you’re participating in the Student Blogging Challenge. 2. Unzip the downloaded file to a folder on your hard drive. You may be just getting started with your class blog or are looking for ways to make improvements. The thousands of students that have participated in the past have found it a great way to improve their blogging and commenting skills and love the global interaction among the community that it builds. For more information on the student blogging challenge, visit the Challenge F.A.Q. here. Please leave a comment on this post if you would like to become a Student Blogging Helper! I am not sure where to post this question, so my apologies if this is not an appropriate place to do so. Are there any challenges for people who are not teachers or students, but who are still kids? @Bev Sorry for the delayed response but been away on holidays and Internet access was a bit challenging. Sure not too late. Just drop past Sue’s post and leave your details. I would really enjoy volunteering as a Student Blogging Helper and hope I’m not too late to join the challenge. As I am currently working with 15-18 year olds in a school Library I would prefer this age group. @beth and @jteague Thanks for offering to help. Could you each visit this post http://studentchallenge.edublogs.org/2010/09/14/september-blogging-helpers/ and leave a small bio about yourself and what age students you would like to help? I would enjoy helping out as well! I work with 6th graders (11-12 year olds), but I can also look at another age group if you need the help elsewhere. This has been a great experience so far for my students…and me! I would like to sign up to be one of your helpers for this challenge. After working with my students and seeing the joy the get from someone answering, I would like to give that back to someone else. I would enjoy helping out as well! I would be happy to look at blogs for students 9-11 years old, but I can also look at another age group if you need the help elsewhere. I am surely available for this job , to help someone is a great thing I love to do this . I would be very happy to help with the student blogging challenge in anyway that you may need. Thanks everyone for offering to be a blogging helper. I will then leave you a comment there about which students to visit. I’d be happy to help out again this year! I teach third grade and the students are 8 and 9 years old. I’d love to be placed with that age group as a first choice. However, put me where you need people! I would love to get involved! I prefer to work with elementary (ages 5-11) students. I would prefer to work with secondary or senior secondary students (15-18 yo). I would love to be a student blogger helper so I can learn more about the Student Blogging Challenge. I would like to help with 8 -10 year olds if you need me. Love to take part again. I’d love to work with students around 12 or 13 years old. I would love to be a student blogging helper. I’d prefer this age group: 11-12. I would really enjoy helping out with the blogging challenge. Being a secondary school teacher my preferred age group would be 13 to 17 years. @Miss Wyatt – done I’ve added the change to the wording! Do we want to get Ronnie to set up a form so that people can submitt it there? Would that make it easier for you? Thanks Sarah, Myles, and Kim We really appreciate it and Sue Wyatt will allocate your students about mid-September. If you can let us know what age groups you prefer that would be excellent! Id like to help in any way that I can. Just let us know. Thanks Sue, Ronnie and Edublogs in general for promoting the challenge again. Could it be mentioned though, that helpers will need to tell us what age group they would like to help comment on as this would make it easier for me during my September holidays when I allocate students for them to visit.